Bumpass was originally known as Bumpass Turnout. 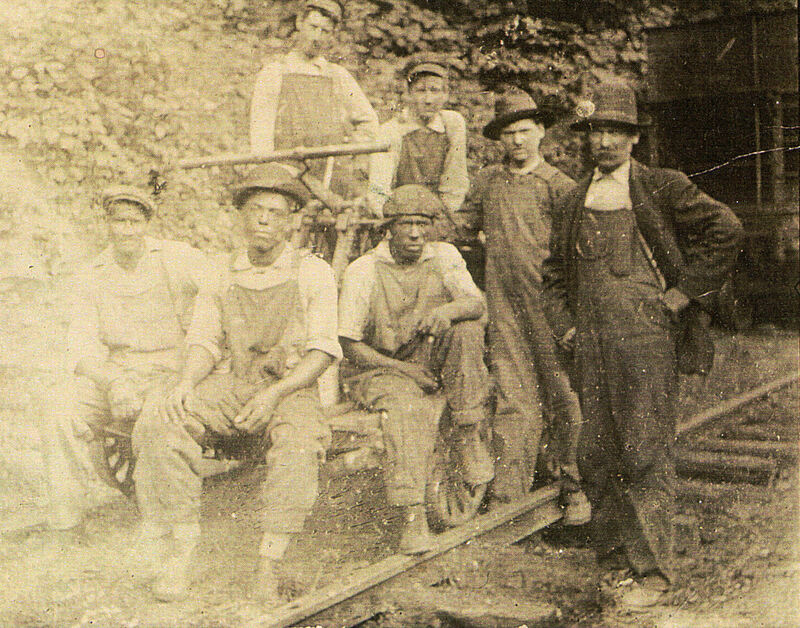 A siding was built by the Louisa Railroad near the Bumpass home as a courtesy to the family. The first agent was Thomas Bumpass. The Post Office in Bumpass opened June 20, 1860 with John T. Bumpass as Post Master. 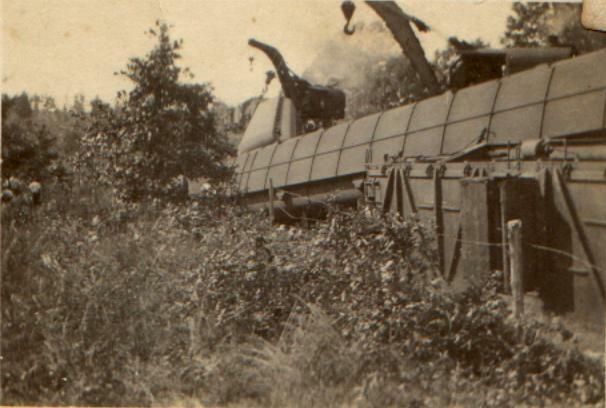 During the Civil War, Union troops under Dahlgren destroyed the tracks in Bumpass. According to the Works Progress Administration of Virginia Historical Inventory (Burtis, 1936), the station agent’s position passed from father to son in the Bumpass family for three generations, ending about 5 years before the report was written. The report also noted that a great deal of grain and tobacco had once shipped from Bumpass, but with the extension of the C&O to the west, that trade had ceased. Burtis also reported that the freight depot in Bumpass had once been a freight car (probably a box car, I think) removed from its trucks. West of the station the railroad had a water tank and huge piles of wood for the locomotives. The town, 44 miles west of Richmond, once boasted a chicken coop factory (operated by C. I. Bumpass, who was the C&O agent at Buckner), a barrel stave mill, and an ice cream spoon factory run by the Grasberger family. The 1937 Side Track Record listed a 1086' house track (track number 854) here. In 1938 the east switch was removed, reducing the length to 936' and turning it into a spur. In May, 1947 a 65-car passing track (track number 2345) was added.This track was noted on both the Bumpass and Buckner Valuation maps, so it must have been between those two stations, but I have no further information on its exact location or length. Bumpass was still an agency station in 1948. The next year it was converted to a non-agency station. In 1956, the C&O stopped handling LCL freight in Bumpass and discontinued handling any freight here in 1961. 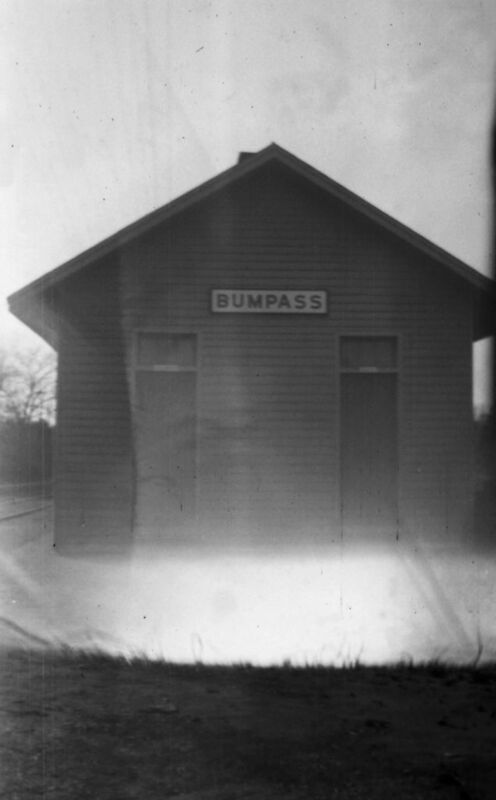 Bumpass still had its passenger station and side tracks as of 1963. I’m not sure when the station was removed, but the side tracks were both retired in 1978. I’m not sure what caused the odd overexposure at the bottom of this image, but it’s otherwise a pretty nice photo. I believe the signs above the doors say "Colored" (trackside) and "White." (Date unknown. Courtesy of Elizabeth Garner and the family of W.F. Harris, Sr, used with permission). 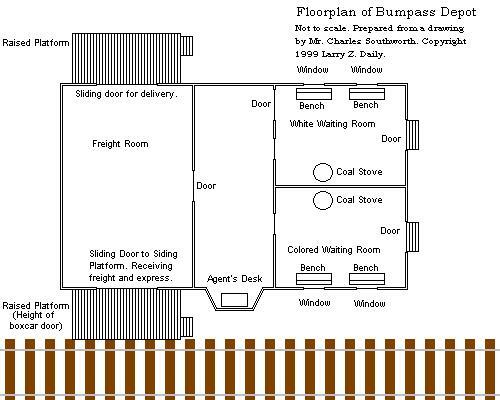 This floorplan of Bumpass Depot was prepared from a drawing done by Mr. Charles Southworth. This is Gladys Harris, aunt of Elizabeth Garner who donated the photo. 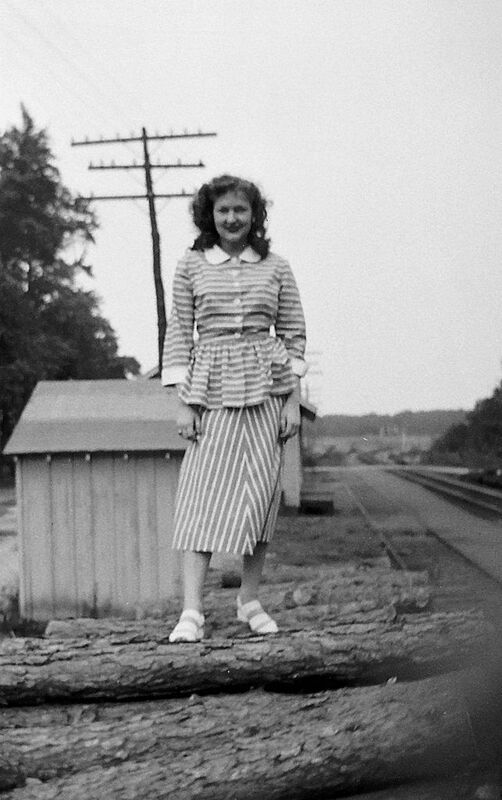 If I had to guess, I’d say that the structure right behind Miss Harris is a coal shed, with the depot in the distance. (1940’s photo. Courtesy of Elizabeth Garner and the family of W.F. Harris, Sr, used with permission). Walter F. Southworth (on right) was Section Foreman on Section 24. He’s at the tool house 150 yards west of the Bumpass Depot. He is holding a level board. 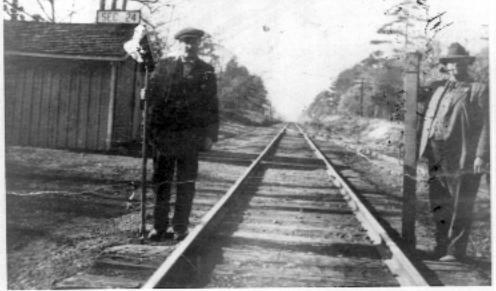 On the left is his brother Harry, a section hand, holding a tamping bar. They helped maintain Section 24, which included Beaver Dam, Tyler, Bumpass, Buckner, and Fredericks Hall. Walter was known for having the smoothest riding track on the Division and never had a rough track report. 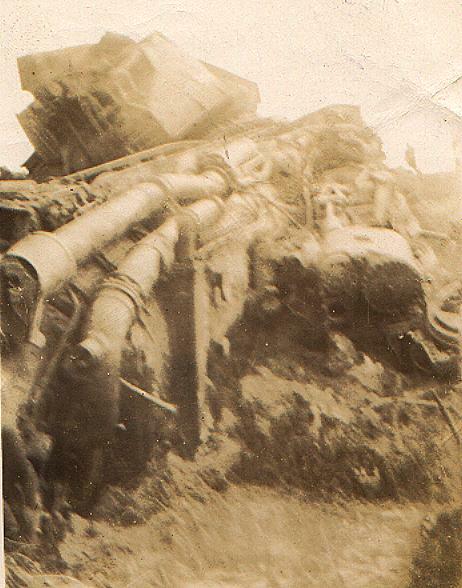 (1930’s photo, courtesy Charles Southworth, used with permission). 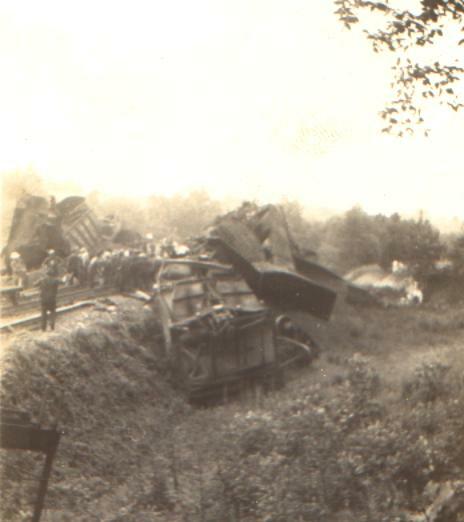 The photos below, provided by Mr. Charles Southworth, show the wreck of a train on the Piedmont Sub. The train is, according to Charlie’s family, Train 47, the west-bound Sportsman, just east of Bumpass. 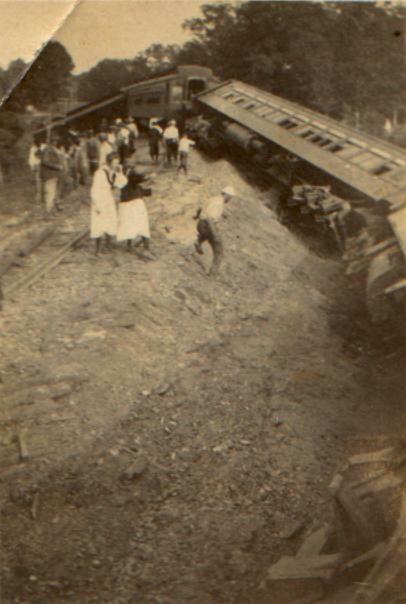 According to Charlie, the accident occurred in about 1934 and his family was waiting to board at Bumpass. If anyone can provide more information about this incident, please contact me at the email address below.